Photo credit: Alfredo Camba Jr. Many summers ago when my father was still alive, our family visited relatives in Los Baños, Laguna. My mother proudly told us that her cousin-in-law, a professor at the University of the Philippines in Los Baños, was part of the team that developed the so-called “Miracle Rice” at the International Rice Research Institute (IRRI). We regularly come across surveys that rank the “best” schools in the world, and here comes another one which, the writer expects, will generate heated discussions as usual. We are reprinting it for what it’s worth and our advice to you is just to take these survey results with a grain of salt. Did you know that Mel Abas earned a master’s degree in mathematics from the Angeles University Foundation in Pampanga? 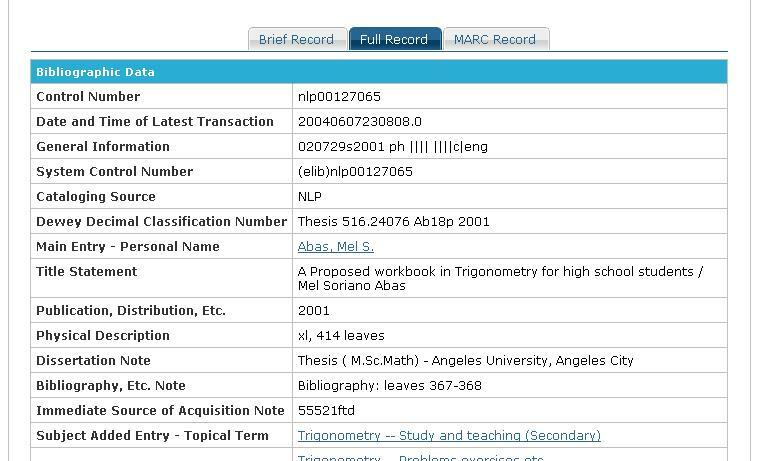 We just found this out when we stumbled upon Mel’s thesis, entitled “A proposed workbook in trigonometry for high school students”, in the online database of the National Library (click image to enlarge). As we all know, Mel moved with his family to Sta. Rita, where he would eventually teach mathematics at Guagua National Colleges’ engineering department. We haven’t heard from Mel since he immigrated to the US several years ago, but wait for further announcement about him next month. We have requested a friend to look for his relatives in Pampanga. Three Philippine universities were among the top 100 Asian universities based on the Quacquarelli Symonds Ltd. rankings which were made public yesterday. They are University of the Philippines, ranked No. 50, De La Salle University (No. 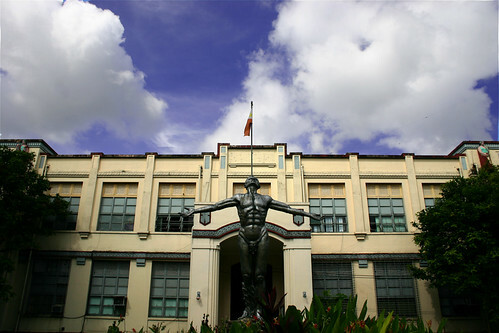 76) and the Ateneo De Manila University (No. 84). QS managing director Nunzio Quacquarelli said the top performing universities were distinguished not only by quality but also by high productivity of research. He said the 100 universities were ranked based on criteria which include Peer Academic Review, Recruiter Review, International Faculty Ratio, International Student Ratio, Student Faculty Ratio and Citations per Faculty. “Philippine universities have performed well, with high recruiter review scores. These results make studying in the Philippines an attractive option for international students,” he said. China, Hong Kong, Japan, Singapore and South Korea were the five countries that dominated the top 10 places in the QS.com Asian University Rankings. The University of Hong Kong, Chinese University of Hong Kong, and University of Tokyo bagged the top three spots. Don”t you think the news item sounds too positive about the overall performance of Philippine universities, considering that we only have three schools in the Top 100 and that the country’s best university, UP, is only 50th? Pamantasan ng Lungsod ng Maynila (PLM) is one university that has nurtured thousands of graduates coming from Manila’s public high schools, not excluding Lakan Dula High School. Our classmates Ariel Dimacali, June Lapira, Evelyn Bongalon and Buddy Ignacio are all PLM alumni. So is George Gange (IV-1, Batch ’68), a distinguished PLM alumnus, who is inviting everyone to attend the school’s upcoming grand reunion homecoming. “The new PLM Alumni Association (PLMAA) is organizing a Grand Alumni Homecoming on February 25, 2009 through March 3, 2009, four decades since its alma mater opened its doors in 1967 to poor but deserving students. Visit the PLMAA website to know more about the event. We just thought of updating the post Other alma maters to include the primary schools we attended. Strange how we forgot to initially include them on the list. Could it be that we were too young to remember our elementary days? Share if you have stories (or photos) of that period, noong mga totoy at nene pa tayo. And please submit the name of your school to finally complete the list.